Linda Brown remembers the spring and summer of 1958 as the happiest time of her childhood. About a week after the school year ended, Linda had another dream. But there were no flying saucers in this one. Only horses. One horse, in particular. Since their cabin was so far out in the country — “the last stop off the school bus after almost an hour” — Townsend and Josephine were concerned that Linda would be terribly isolated when school let out. So they came up with an idea that might keep her occupied through the summer. They offered to buy her a horse. For the next week or so, Townsend and Linda drove around to farms in their rural community, trying to find just the right horse. At one point Linda almost gave up the quest, actually entertaining the notion that her parents were playing some kind of “mean trick” on her. “I can remember actually thinking that,” she says. As fate would have it, the father of Tommy Carmichael — the boy who had been so welcoming in the schoolyard — just happened to be a local horse trader whose barn was just outside of Walkertown. Townsend had asked him to look over some of the horses and “I think that he was beginning to think that Dad would never be satisfied either,” Linda said. And then one night, Linda had a dream. Townsend listened intently. When she was done describing her dream, he said, “Sweetie, I think there’s a reason why the horse in your dream was riderless. That horse is looking for you.” And then Townsend got ready to go to work at the Bahnson lab, dropped Linda off at the bus stop at the top of their lane, and told her to have a good day at school. While Linda was in school, Josephine got a call from Mr. Carmichael, who had another horse to show them if they could come into town that evening. Josephine called Townsend at the lab, arrangements were made, and everybody prepared to converge on the Carmichael farm later that day. As he opened the gate to bring the horse to Linda and her parents, Tommy misjudged the opening; the gate swung back and bumped the mare on her hind quarters. The startled horse reared and bolted, tearing herself away from Tommy’s grip, and proceeded to run circles around inside the arena fence — which was also identical to the fence that Linda had seen in her dream. After the horse-trading was done, Townsend took Linda to a local restaurant. Linda chattered on about what great care she was going to take of her new treasure. And then Townsend presented her with another one. He reached in his pocket and pulled out a tiny box. Inside was a silver ring with a dazzling blue lapis-lazuli stone. Linda put that ring on her finger in June of 1958, and wore it every day of her life until she gave it to Morgan on New Years Day in 1966. 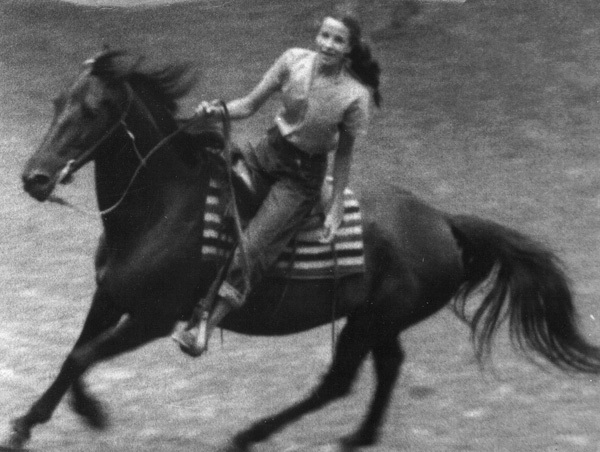 A girl and her horse: Linda Brown and "Beauty"
While in Florida in 1957 [Dr. Brown] continued to refine and develop that "network of sets" and the organization that went with them. That year… Agnew Bahnson [contacted] Dr. Brown and set up even further work on the propulsion system, which is a direction that Dr. Brown had decided he needed to pursue. Actually he was becoming interested in developing further what he called then the "Flame Jet Generator". Of course, the promised “details” never really did follow, and so we have been left to speculate just what was that “major” something that happened during August 1958 that would ultimately prove to be such a pivotal event in the life of Townsend Brown and his family. One event that may have been a precipitating factor was the international situation known as the Second Taiwan Strait Crisis. Starting August 23, Mao Tse-tung ordered the heavy bombardment the islands of Quemoy and Matsu. These tiny islands, less than 10 miles into the Strait of Taiwan, were among the last strongholds of Chiang Kai-shek’s vanquished Nationalists, who used the islands as a staging ground for frequent raids into the Communist controlled mainland. Furthermore, Mao — who had only recently stated his belief that half of the population of China could survive a nuclear war — was determined to assert his independence from the Soviet Union’s dominance of Communist ideology. Mao was still six years from acquiring his own nuclear weapons, but that did not deter his willingness to confront the Eisenhower administration with repeated declarations of his intent to “liberate” Taiwan. Eisenhower and his Secretary of State, John Foster Dulles, were determined to provide whatever support was necessary to preserve what little was left of Chiang Kai-shek’s government in exile. Promising “timely and effective action to defend Taiwan,” a large naval force was dispatched to the area. And that’s where they started running into problems — with communications. The trail starts getting harder to follow from here, but let’s see what breadcrumbs we can find along the way…. Another significant development that took place during the same month — August, 1958 — was the appointment of one Louis Tordella as deputy director of the NSA. With Tordella’s appointment, the face and focus of the United States intelligence community changed dramatically, comprehensively — and quickly — on all fronts. Tordella proposed a system known as CRITICOMM. After Tordella outlined the costs and benefits, Eisenhower turned to the deputy secretary of defense and said, “Do it.” Within six months NSA was able to reduce transmission time from more than 8 hours to 52 minutes. In another six months the agency was able to have a CRITIC, or critical intelligence message, on Eisenhower’s desk within a brief thirteen minutes, regardless of where it had originated. Eventually, the time shrunk to between three and five minutes. When I read that passage in Bamford’s book, I knew instantly that I had seen it before. Somewhere in there, between Bamford’s book and Morgan’s messages, are Townsend Brown’s fingerprints. And for all we know, Morgan could just as well have been Bamford’s confidential source as well as mine. Electrodynamics appears to be an interesting frontier of both applied and pure research today. Electricity, which is essential to modern society, is poorly understood from a basic standpoint of what the field forces constitute or what they may imply. Our research has approached this problem of electro-dynamics on a macroscopic level. Much of the time during the last year and a quarter has been devoted to the objections of the classical viewpoint toward observed phenomena. The very premise that a simple condenser of a certain geometrical configuration will show not only an attraction of one plate to another but also a movement through space of the entire assembly has not only been doubted, but when understood has been declared as a phenomenon to be ignored or written off in terms of wind effects in air or environmental influence in a vacuum. One of the major objections raised against these experiments was the gross macroscopic effects observed. But one should recognize the fact that we are working on a macroscopic level of 200kv with relatively confined quarters both in air and in vacuum. The comment has also been voiced that strange things happen at high voltage (emphasis added) and particularly in high vacuum, but this hardly appears to be a defensible excuse for the modern scientist to ignore the phenomenon. The problem becomes: can the investigation of these strange things be fruitful. A truly new and practical propulsive means is one of the high priority goals of both military and civilian science. Our experiments indicated a propulsive means, generally unexpected, both in air and in vacuum. The vacuum experiments which may point to space propulsion are hopelessly complicated in our present laboratory by three things: the degree of vacuum, the proximity of the bell jar walls, and the inadequacy of combining an electromagnetic or alternating current with static electricity which shows certain subtle results. It appears to be a paradox that the modern scientist is intrigued by the microscopic evidence in an unfamiliar field but will quickly discount a macroscopic phenomenon in an unexpected manifestation, even though no conclusive explanation is forthcoming. On October 30, 1958, Bahnson describes a visit to the lab by Dr. Jonas Whitten and Dr. Daniel Kahn, both representing the Glenn L. Martin Company. The third item in the agenda is a presentation on the subject of "Electrohydrodyamics by T.T.B." That is the last time Brown is mentioned in Bahnson’s notebooks. The Brown family’s whole North Carolina adventure lasted less than seven months, from the middle of April until the end of October, 1958. What Linda Brown remembers most about leaving Walkertown is her own tears. In plotting the lines of force in various electrode configurations, it becomes apparent that some rather surprising results could be produced which, at first glance, would seem to be in direct violation of the basic electrostatic laws. 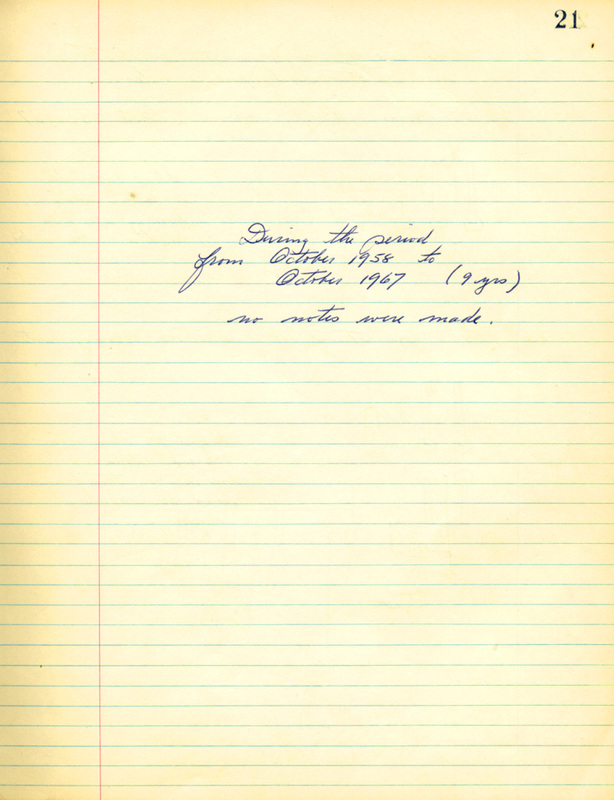 After completing this entry in Volume #2 of the notebooks he had been diligently keeping for more than three years, Townsend Brown closed the cover.